Sure-Shot HD Video Production offers competetive prices across all its video packages. * GUESTS BEING WELCOMED TO RECEPTION. * 4 CAMERAS (3 X STATIC + 1 X SHOULDER MOUNTED/HAND-HELD). * USE OF CAMERA DOLLY AND STEADICAM WHERE APPROPRIATE. * LAVALIAR (LAPEL) AND RADIO MICS (where appropriate) FOR HIGH QUALITY SOUND RECORDING OF CEREMONY AND SPEECHES. 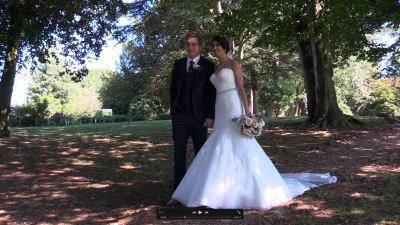 *LOAN OF 2 CANON LEGRIA HF R406 POINT AND SHOOT CAMERAS FOR FILMING BRIDE AND GROOM GETTING READY AND THROUGHOUT THE DAY. (!) THESE ARE LOANED AS A GOOD WILL GESTURE ON THE UNDERSTANDING IF DAMAGE OCCURS BY MIS-USE OR NEGLIGENCE ALL OR PART OF THE REPAIR COST WILL BE ADDED TO THE FINAL BILL. EXTRAS = LOAN OF 2 CANON LEGRIA HF R406 POINT AND SHOOT CAMERAS FOR FILMING BRIDE AND GROOM GETTING READY AND THROUGHOUT THE DAY. CONTACT ME: AND MAYBE WE CAN WORK OUT A PACKAGE TO SUITE YOU POCKET. Andy Barnard at Sure-Shot HD Video Production is a former BBC Video Producer and Journalist who aims to draw upon his experience to bring professionalism, creativety and fun into your wedding, business and event productions.